2007 Chevrolet Silverado 1500 Pros and Cons | Page 1 of 1 | Why Not This Car? What drives people to buy (or not buy) a certain car? 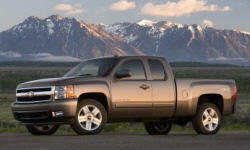 TrueDelta's members share 2007 Chevrolet Silverado 1500 pros and cons based on their real-world driving experiences. Nice looking truck that rides very smooth and quiet. 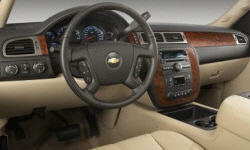 LTZ model has a car like interior thats very comfortable on long trips. I still look forward to driveing it even after 2 years. The Silverado uses small buttons for the radio and (optional dual zone) climate controls. Because of the long reach to the radio, the size of the buttons is a hindrance. The dual zone climate controls use a mass of buttons that are not intuitive to use. The NBS has a great powertrain. I am a fan of the 5.3L V8. I think the AFM is a good thing. The final push for me was the Flex Fuel Vehicle. I am a huge proponent of E85.